His death ran headlines in all the newspapers. family friends and admirers, but also amongst the people of Sri Lanka in general. It was Martin Wickramasinghe's wish that his last rites be performed in Koggala. His cremation was simple and traditional. Samadhi, in Koggala near the house where he was born. 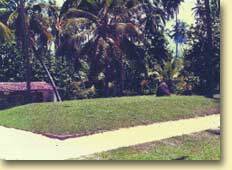 Martin Wickramasinghe's ashes were buried here in 1976. His wife Prema Wickramasinghe's ashes were buried besides his in 2001.
the lyrics of the ode to Martin Wickramasinghe written by Mahagamasekara are buried under the head stone, which is a rock from near the reef with its marine life that prompted him as a child to read books on biology. 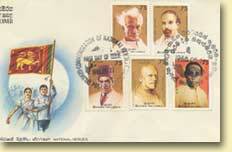 1st day postal cover with the commemorative stamp. Sri Lanka of this century. Chairman of the Trust in his library. 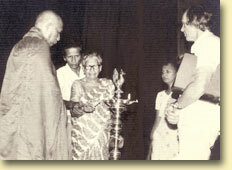 1980 in the presence of the Chairman of the Martin Wickramasinghe Trust Moratuwe Sasanarathana Nayaka Thero. 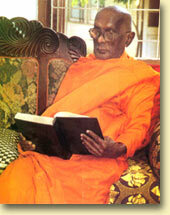 After his death in 1981, Akuratiye Amarawansa Nayaka Thero succeeded him as Chairman of the Martin Wickramasinghe Trust. 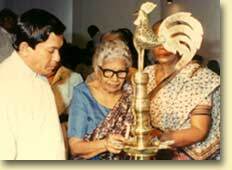 at the inauguration of the 100th Birth Anniversary celebrations of Martin Wickramasinghe in the year 1990. 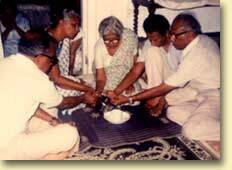 Alms giving, on the seventh day after his death took place in the house in Koggala where he was born. Launching of Ape Urumaya ha Bhikshun Wahanse. by Martin Wickramasinghe "Ape Urumaya Ha Bhikshun Wahanse" (Our Heritage and the Sangha). 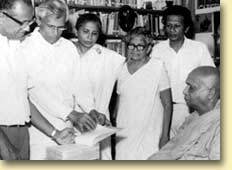 There have been three other unpublished books of Martin Wickramasinghe's writings published posthumously. Ven. Akuratiye Amarawansa Nayaka Thero. 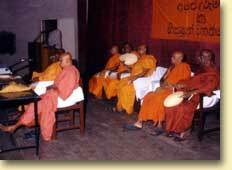 Chairman, Martin Wickramasinghe Trust, Chief Incumbent Vidyodaya Pirivena, Chief Sangha Nayaka Southern Sri Lanka, Panditha, M.A., Author of Vansattappakasini, Maha Vansa Tika, Divyavadanaya etc. Professor Trevor Ling lighting the traditional lamp with Ven. Sasanarathana Nayaka Thero & Prema Wickramasinghe just prior to delivering his Martin Wickramasinghe lecture. 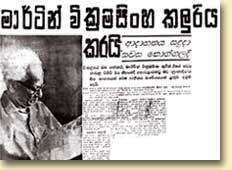 Martin Wickramasinghe lectures were inaugurated in 1978. The inaugural lecture was delivered by Professor Joseph Needham. The purpose of these lectures was to present the views of internationally acknowledged intellectuals on areas of knowledge explored by Martin Wickramasinghe to local audiences. 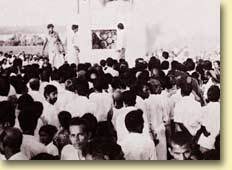 Although most of the lectures were delivered in English, translations of the text of the lecture in Sinhala and Tamil were given to the audience at the lecture itself. Darwin, Darwinism and the Condition of Man. Martin Wickremasinge 's Vision of National Identity.